There are many choices when it comes to markdown editors. There are web based editors, platform specific and cross platform editors. Also, don't forget about the various text editor plug-ins that allow you do do markdown in them. After trying several editors and several plug-ins I stubled accross Haroopad. What makes Haroopad different from the other markdown editors? Well other than being lightweight and easy to learn it has several other very useful features. 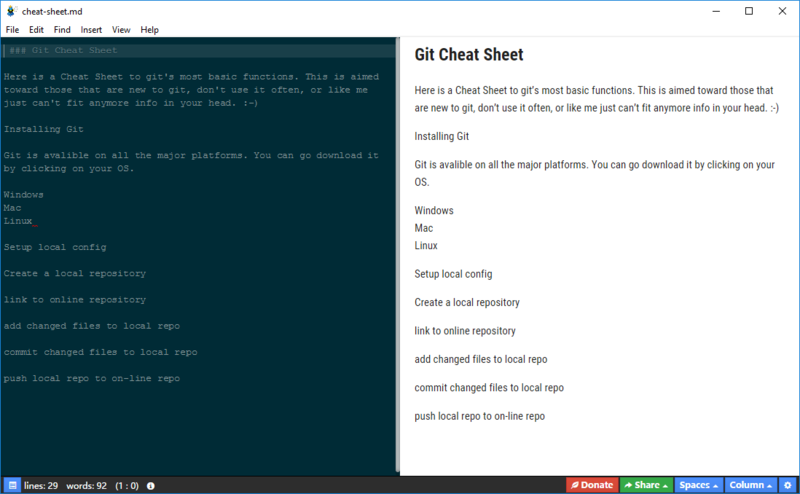 Haroopad offers GitHub markdown, which means it does Tasks - nice for a floating window with a list of things to be done for the day or for a project, and which allows for the satisfying ability to check them off as done. HarooPad also runs on Windows, Mac, and Linux, which is a rarity. It is a minimalist markdown editor (which I greatly appreciate) with folding (the ability to hide or "collapse" text under a heading). It may not be quite as polished as some of the other markdown editors and it lacks spellcheck but I would guess this would be incorperated at some point in this great open source project. If you want to give it a try you can check out their web site. You can also visit the GitHub repository to get a good feel of the latest features and what is in store down the road. Haroopad is a great tool to add to your programming tool-belt and as a matter of fact this blog entry was written using Haroopad.